Nikon film scanners are generally considered professional level and the Nikon Scan software is well matched with the scanners. Nikon scanners are often used as the standard for comparing other film scanners. The options and workflow for Nikon Scan are very well designed and the reference manual (Nikon, Inc., no date) is remarkably well written and useful. Nikon Scan handles tone and color adjustments well, but the coding of information about working color space in the output files can cause problems and is best updated with image-editing software. The sad fact that Nikon no longer makes film scanners or supports the software for new operating systems reflects the limited market for film scanners. Nikon Scan is included in this guidance because many Nikon scanners are in use and used models can be obtained. Although Nikon has not upgraded Nikon Scan for use with Windows 7, modified drivers have been developed and are freely available at various places on the internet. Following such guidance I was able to install and use Nikon Scan with a Windows 7 64-bit system with no problems. Instructions for modifying the driver files or obtaining the modified driver files can be found by an internet search for Nikon Scan Windows 7. The basic strategy is to install Nikon Scan for Windows Vista and then use a modified .ini file with the driver. Note that attempting to run Nikon Scan in Windows 7 XP Mode is not optimal because XP Mode is limited to 16 bits for color display rather than the usual 32 bits. As shown in Figure 4.1 the workspace for Nikon Scan consists of a large preview image display with a scanner controls panel on the upper left and an array of tools in the Tool Palette on the right. The preview image has a tab labeled Processed that shows the image with adjustments and a tab labeled Natural that displays the original image without adjustments. In Nikon Scan the area that is selected for inclusion in the final scan is called the crop area. Figure 4.1. The main workspace for Nikon Scan. A large preview image is displayed with a scanner controls panel on the upper left and an array of tools in the Tool Palette on the right. The output for the final high-resolution scan is displayed in a separate image viewer that is behind the preview display. The preview display can be moved or reduced to see the high-resolution image. Many of the color and tone adjustments can be applied to the high-resolution image after the final scan as well as to the preview image before the final scan. Sets of settings can be named, saved, and loaded for reuse by clicking the Settings button on the scanner controls panel on the upper left. This feature is very useful. Negative film is handled in strips with two or more frames. When the Preview button is initially clicked for a film strip the scanner automatically determines the number of frames. The thumbnail tab is an unlabeled, inconspicuous vertical bar on the upper right side of the scanner controls panel. When the mouse pointer is over the bar it expands and clicking the bar opens a small panel with an icon for each frame on the film strip. Clicking an icon activates the selected frame for scanning. When the active frame is changed, the Preview button needs to be clicked again. An Eject button on the top left of the scanner controls panel is clicked to eject a film strip from the film holder. Preferences that apply for all scans are set with the blue Prefs button in the scanner controls panel on the upper left. Clicking this button brings up several categories of preferences. The preference settings are identified here by the category and item label. For example, Preview Setting> Digital Ice: indicates the item or field labeled Digital Ice under the category Preview Settings. Most preferences can be left with the default settings and are not listed below. The preferences that pertain to color management are described in a later section. File Saving> Default File Format: will typically be set to TIFF for archival purposes. JPEG with the Compression level set to “Excellent Quality” could be used if storage space is a severe limitation. The default file format can be changed when the output file is actually written. Advanced Color> Auto contrast calculations (% excluded): should be set to zero in both the Black and White fields for archival scanning. These values set the degree of clipping when auto adjustments are made to a histogram. Advanced Color> Sample point size: sets the number of pixels used with the eyedropper tools. The value “5x5” is less susceptible to noise. Advanced Color> White point target: and Black point target: set the degree of white and black color for the white and black points in the output image when the white and black eyedroppers are used to determine the white and black points. These are only used with the black and white eyedroppers, which are not recommended for archival images. Automatic Actions> Perform auto focus when focus tool is moved: should be checked to reliably apply the Focus Tool that is sometimes useful. Preview Settings> Digital ICE: determines whether the Digital ICE infrared dust and scratch correction is applied to the preview image as well as to the final high-resolution scan. The main benefit of applying Digital ICE for the preview is that dust and scratches will not interfere with setting the black and white points on the histogram. This is a significant benefit and I usually check this option. However, the preview scan takes longer if Digital ICE is applied. The resolution of the preview image is too low to allow critical evaluation of the effects of Digital ICE. Certain fields on the Tool Palette on the right will have standard settings. In the Scanner Extras section, the field for Pixel Data Size determines whether the output image is 8 bits per channel or 16 bits per channel. The initial scan and processing is always done with 16 bits per channel. This setting applies to the bit depth of the output file. The sections for Color Balance and Unsharp Mask should be turned off for archival scanning. Click the checkbox to make it show a X.
I do not find the LCH Editor useful and also set that section to be turned off. However, others might find it useful in certain situations. 1. Load the set of saved default settings that are appropriate for the type of source item. 2. Turn on infrared dust and scratch correction if it is being used. 3. Create the preview image and select the area and resolutions for scanning. 4. Adjust tone and color. 6. Create the high-resolution scanned image. 7. Set the output file type and name, and save the file. A set of saved settings is selected and loaded by clicking the Settings button in the scanner controls panel and then selecting one of the named sets from the dropdown menu. Specific settings that are useful to include in a set of saved settings are noted in the discussion below. The type of source item is set with the middle button in the scanner controls panel on the upper left. The options are “Positive” for slides, “Neg (Color)” for color negatives, “Neg (Mono)” for black and white negative film, and “Kodachrome” for Kodachrome slides. The Kodachrome setting is particularly important if Digital ICE infrared dust and scratch correction is applied. As described in Chapter 2, infrared dust and scratch correction can be very useful for color negatives and slides but is not applicable for most black and white film. In Nikon Scan applying the Digital ICE infrared dust and scratch correction to the preview image can be helpful in making adjustments for tone and color. This option can be set at this point in the workflow, but is most efficiently handled by including it in the set of saved settings. The Digital ICE checkbox is in the Digital ICE4 Advanced section of the Tool Palette. Check the box for Enable Digital ICE. The setting “On (Normal)” usually works very well and the other option “On (Fine)” usually does not work well. The Nikon Scan reference manual (Nikon, Inc., no date, page 62) states that this implementation of Digital ICE works well with most but not all Kodachrome slides when the film type is set to “Kodachrome” and a 5000 ED, 9000 ED, or Coolscan V ED scanner is used. That is consistent with my experience and is different from the usual implementation of infrared dust and scratch correction, which does not work well with Kodachrome. Click the Preview button to create the preview image. If needed, the image can be rotated by clicking one of the rotate buttons with a curved arrow in the Layout Tools section of the Tool Palette on the right. The crop area defining the final scanned image is set by dragging the edges of the white dotted rectangle on the image. The preview image and the window containing it can be enlarged and moved by dragging the edges of the image and window frames. Scanning resolution is set with the Crop section of the Tool Palette. For archival scanning with the output image matching the size of the original item, the easiest settings are to check the button for “Keep this Crop” and set the units to Inches. For the next row “Keep this Output Size” set the units to Pixels. This will display the total number of pixels on each side of the area selected for scanning. Set the units for the Resolution: field to Pixels/Inch and specify the resolution. As discussed in Chapter 2, for 35 mm slides this would typically be about 2300 pixels per inch for 3000 pixels on the longest side, or 3000 pixels per inch for 4000 pixels on the longest side. The Scale: field needs to be kept at 100% to maintain the proper size for the output image and may need to be reset if the resolution is changed. These settings can be included in a set of saved settings. As noted in the Introduction to this scanning guidance, adjustments to tone and color are described for three different conditions: (1) the scan is not adjusted for tone and color because those adjustments are made later with image-editing software, (2) the scan is adjusted for fading and exposure, and (3) the scan is adjusted for a reference target that is included to represent the current condition of the item. First, the settings to handle negatives are described. Nikon Scan attempts to handle negatives without requiring the user to specify the brand and type of film. In general this works surprisingly well and is a very useful approach for historical items because the brand and type of film are often unknown. The usual process with other scanning software of trial and error exploration of different brands and types of film seems inconvenient and inefficient after working with Nikon Scan. Digital ICE infrared dust and scratch correction and Digital GEM grain reduction do not affect tone or color and can be applied with either type of output file described below. Converted Output. Nikon Scan can apply the scanner color profile and convert the image to a working color space but not do any other adjustments to tone or color. Color Management is turned on in Nikon Scan for this output, but the tone and color adjustments in the Tools Palette are all turned off. Raw Output. The raw image from the scanner can be output without application of a color profile for the scanner and without conversion to a working color space. Image-editing software would be used to apply a scanner profile and to convert the image to a working color space as well as to make all needed adjustments to tone and color. This unconverted output image is created by turning off color management and all tone and color adjustments. Click the Prefs button on the scanner controls panel, then select Color Management, and clear the checkbox for Use Nikon Color Management System. Also, verify that the Tools Palette sections for Curves, Color Balance, Unsharp Mask, LCH Editor, and Scan Image Enhancer are all turned off. The histogram and curves adjustments in Nikon Scan are combined into one display in the Curves section of the Tool Palette. The default histogram display is for the input image. Clicking the top Histogram button to the right of the histogram chart toggles the display to show the histogram for the output image after adjustments have been applied. An unlabeled pick-list above the histogram chart selects which color channel is displayed in the histogram. Overall tone is labeled RGB and the red, green, and blue color channels are labeled accordingly. Set the Black and White Points. The Auto Contrast button is second from the top to the right of the histogram chart and sets the black and white points for the red, green, and blue color channels. As noted in the section on default settings above, the default settings for auto contrast for archival scanning should be zero clipped pixels so the black and white points are set to the darkest and lightest tones in the area selected for scanning. A counterintuitive feature of Nikon Scan is that the Auto Contrast button does not set the black and white points for overall tone. The black and white points for overall tone are set by holding down the Control key while clicking the Auto Contrast button. In general, holding down the Control key while clicking the Auto Contrast button applies the black and white points to only the channel that is currently selected for display. The default behavior of the button without the Control key is to apply to the three color channels at once. A typical workflow for color images would be click the Auto Contrast button and then click the button again with the Contol key held down. For images without a full range of color, such as documents or photographs in snow or during sunset, the Auto Contrast option is usually not appropriate and manual setting of the black and white points is needed based on visual evaluation of the preview image. Minimize Distortion. As described in Chapter 3, borders, dust, and damage in an image sometimes interfere with setting the black and white points. In Nikon Scan the crop area rectangle that defines the final scan area also determines the area used with the histogram. The crop area can be temporarily reduced to minimize interference from borders and edge damage in determining the black and white points. After the black and white points have been set, the crop area can be expanded back to the original size. The black and white point settings will remain fixed and apply to the larger area—as long as they are not changed after the crop area has been expanded. In addition, performing Digital ICE infrared dust and scratch correction on the preview image will reduce interference from dust and damage in setting the black and white points. Set Output Tones for Black and White. The darkest and lightest tones in the output image can be set to specific values by adjusting the sliders on the vertical axis of the histogram. As discussed in Chapters 2 and 3, it is good practice to make the darkest and lightest tones in the output image not be pure black and pure white. The lower slider sets the tone for the black point in the output image and the upper slider sets the tone for the white point. This is done separately for overall tone and for each color channel. The most efficient, reliable way to work with the histogram in Nikon Scan is to include useful settings in the saved sets of settings. When creating saved settings, the histogram can be set to straight diagonal lines for no modification of the image. Clicking the lower Reset all curves button to the right sets the histogram to this default on all color channels. Then the vertical sliders on each color channel can be set to the darkest and lightest tones that are wanted in the output image. Saving these settings will make them easily available as a starting point for other images. On my computer the settings saved with the Settings button in the scanner controls panel on the upper left do not always work reliably for the Curves/histogram adjustments. These settings work reliably for color film but not for black and white film. However, the Curves/histogram settings can also be saved by clicking the menu icon on the right of the Curves section header. This gives the options to save and reuse specific curve settings. This works reliably with black and white film and can also be useful with color film. Adjust the Mid-Tone Slider if Needed. The middle slider below the histogram is the usual mid-tones or gamma slider and is normally applied after the black and white points have been set. As described in Chapter 2, this slider adjusts tone without changing the black and white points. Gray Eyedropper and Color Adjustments. The middle of the three eyedropper buttons to the right of the histogram chart is the usual gray eyedropper that can be very effective for correcting color. The eyedropper button is clicked and then the mouse pointer becomes an eyedropper. Move the tip of the mouse pointer over a spot on the image that should be a shade of gray and click the mouse. This causes the red, green, and blue mid-tone sliders to adjust to make the spot gray with the same overall tone. The gray eyedropper remains active until the icon is clicked again or until another tool is selected. Clicking a different spot makes it the active adjustment point. Different points can be tried until a good adjustment is found. If additional color adjustments are needed the mid-tone sliders can be manually adjusted for individual colors. Digital ROC is a method for enhancing colors of faded sources. It is found in the Digital ICE4 Advanced section of the Tools Palette. Unfortunately, my experience has been that it rarely works optimally for archival scanning. It tends to do too much and I rarely have used the results. Setting the slider to 0 turns off Digital ROC and that is my normal setting. The Redraw button at the bottom of the Digital ICE4 Advanced section of the Tool Palette must be clicked to make any changes to the setting for Digital appear in the preview image. Adjust Contrast. The curves adjustments are displayed overlaying the histogram chart. Clicking on a curve creates a point that can be used to modify the curve. As described in Chapter 2, the curves can be used to increase or decrease contrast, but Nikon Scan has a more effective option for reducing contrast. Digital DEE is a method for reducing contrast and enhancing detail in shadows and highlights when there is too much contrast. It is found in the Digital ICE4 Advanced section of the Tools Palette. It is intended for situations such as photographs in bright sunlight or with back lighting. Click the Digital DEE checkbox and then the More button if the button is showing. This activates sliders that allow separate adjustments for shadows and highlights. The settings that are useful vary widely but are often between 10 and 50. A third slider is for Threshold and determines the range of shadow and highlight tones that are affected by the other sliders. Moving the threshold slider to the right increases the detail in shadows and makes the image brighter. Moving it to the left increases the detail in highlights and makes the image darker. I sometimes use relatively mild application of Digital DEE. The Redraw button at the bottom of the Digital ICE4 Advanced section of the Tool Palette must be clicked to make any changes to the setting for Digital DEE appear in the preview image. In my experience, Digital DEE is not as sophisticated as the Shadows/Highlights adjustment in Photoshop CS and Photoshop Elements and is more prone to color shifts. Reference targets for adjusting tone and color are not applicable when scanning historical slides and negatives, which are the source items for Nikon film scanners. As mentioned in Chapter 2, Nikon film scanners tend to over-emphasize film grain, particularly with black and white film. 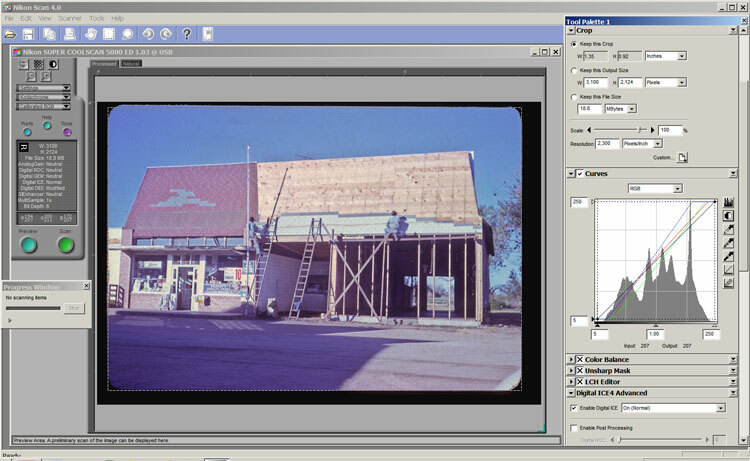 Digital GEM is a method for reducing grain in an image and is well matched to Nikon scanners. It is found in the Digital ICE4 Advanced section of the Tools Palette. I apply it to most 35 mm negatives and slides. A slider for Digital GEM has settings ranging from 0 to 4. When the setting is 0, Digital GEM is turned off. A setting of 1 is virtually always beneficial with no loss of useful detail in the image, and 2 is appropriate in many cases, particularly for black and white film. In cases with severe grain, 3 may be appropriate. The purpose of grain reduction at this stage is to produce a more acceptable master image, not to produce an image for presentation. A setting that is too high will make areas of the image artificially smooth like plastic. The safest practice is to keep grain reduction light at this stage. I normally keep Digital GEM turned off until the final scan because it significantly increases the time for a preview scan, and a high-resolution scan is better for evaluating the effects. The Scan button is clicked to make the final high-resolution scan. As the scan starts the settings in the Tool Palette change as it becomes set to apply to the high-resolution image that will be viewed on a separate image-viewing screen. The changes to the Tool Palette can be disorienting or alarming until a user become familiar with the process. Nikon Scan also has an option to manually set the point for focusing the scanner on the image. This can be useful for warped film or if a key point such as a person’s eyes are not quite in focus. The Focus Tool is a button on the top row of the Layout Tools section in the Tool Palette. Clicking the button converts the mouse pointer to a special symbol that is placed over the appropriate focus point on the preview image and clicked. The image for the high-resolution scan appears in an image viewer behind the preview image. Clicking the icon in the upper right corner of the preview image to minimize the preview image will display the high-resolution image with its own tools. The default setting is that clicking on the high-resolution image makes the image zoom in. Holding down the spacebar makes the mouse pointer turn into a hand tool that can move the zoomed image by clicking and dragging it. Holding down the Alt key sets the mouse to zoom out. The basic tone and color adjustment tools in the Tool Palette can be used with the high-resolution image. The Tool Palette becomes automatically directed to the high-resolution image. The high-resolution image can be saved with the usual File> Save As command or by clicking the icon for Save. A typical dialog box comes up that can be used to set or change the file type, name, and location. Clicking the icon for the reduced preview image restores it and returns Nikon Scan to scanning mode. Occasionally it is necessary to click on the preview image to get the Tool Palette to become active for scanning rather than the high-resolution image viewer. Nikon Scan has batch scanning options that can be used with filmstrips and with optional adaptors for handling slides and roll film. The batch scanning options can save significant time if the same settings can be applied to different images. However, scanning for historical archives normally requires that the settings be determined individually for each image and the batch scanning options are not described here. Color management is implemented with the Prefs button on the upper left scan controls in Nikon Scan. The Color Management category has three tabs labeled Monitor, RGB, and CMYK. Color Management> Monitor> Use Nikon Color Management System: is a checkbox that turns on color management. Color Management> Monitor> Use custom monitor profile: is a button that indicates a custom profile will be used for displaying the preview and final image in Nikon Scan. The button labeled “Choose Custom Profile” is clicked to select the color profile file for the monitor display. Because this selection will have to be updated each time the name of the custom profile file is changed, it is more efficient and reliable to use a fixed file name for the profile. The alternative button for “Use factory default monitor profile” uses a generic sRGB monitor profile provided with Nikon Scan. A custom monitor profile is preferable, even if the profile is one that came with the monitor. Color Management> RGB> Color Space: sets the working color space for color management. As discussed in Chapter 2, the preferred options for archival scanning are Adobe RGB (1998) or sRGB for color, and Gray Gamma 2.2 for grayscale. The tab for CMYK is not used for archival scanning. The preference category Gamma is used to set the gamma for display when a color profile is not used for the monitor. As noted above, use of a color profile for the monitor is preferable. Nikon Scan comes with its own scanner profiles that work well in most circumstances. However, some users report that their scanners tend to produce noticeable color casts. Nikon Scan does not have specific settings for using a custom color profile for the scanner, but it is relatively easy to use a custom profile. Nikon Scan has profiles for the specific model of scanner and type of source item (slide or negative). The reference manual (Nikon Inc., no date) provides information about the location and name of the profiles and the ScanDig website (Wagner, no date) notes that a custom profile can be used instead of the Nikon profile if the profile file is named appropriately. For Windows 7 the Nikon profiles are in the folder “c:\Program Files (x86)\Common Files\Nikon\Profiles”. The scanner profiles have file names like NKLS5000_P.icm for the Nikon LS5000 scanner. The _P indicates the scanning source is positive or a slide. Similarly a profile name with _N is for scanning negatives and _K is for Kodachrome slides when the scanner has special settings for Kodachrome. The original Nikon profile can be renamed and saved. Then a custom profile can be given that file name and placed in the folder with Nikon profiles. My experience has been that Nikon Scan will use the custom profile with no problems. A comparison of results for a custom profile applied with Nikon Scan and for the same profile applied with Photoshop is described below and verified that Nikon Scan properly applied the custom profile. The custom scanner profile needs to be made with special software for making scanner profiles, as described in Appendix A. The basic process is to obtain an IT8 target on a 35 mm slide. The target is scanned with Nikon Scan and output to a file in TIFF format. All color management and adjustments are turned off. Remember that Nikon Scan must be restarted for changes in color management settings to take effect. The profiling software uses the TIFF file to create the color profile for the scanner. After the original Nikon profile has been renamed, the custom profile file is given the appropriate name and placed in the folder for Nikon profiles. I compared images made using a custom scanner profile in Nikon Scan with application of the same profile with Photoshop CS. Using the workflow that all tone and color adjustments are made with an image-editing program and color management is turned off in Nikon Scan, I made unadjusted images of an IT8 target and an historical slide. The custom profile was assigned in Photoshop. The resulting images were compared with images created by Nikon Scan using the same custom profile. When the rendering intent for conversion in Photoshop was set to perceptual, the results were essentially identical (using methods described in Appendix A for comparing rendering intents). The results were not identical when the rendering intent was relative colorimetric or when the images were compared to images made with the default Nikon scanner profile. Examination of the default Nikon scanner profiles using methods described in Appendix A reveals that the profiles have data for only the perceptual rendering intent. The workflow above that handles the color space conversion in Photoshop with custom profiles allows the use of the relative colorimetric rendering intent. Note that the Digital ICE infrared dust and scratch correction and the GEM grain reduction are the key adjustments with Nikon Scan and can be applied to the raw images even when the color conversions are done in a later step with Photoshop. After exploring various options, my typical use of Nikon Scan is straightforward. I use the default Nikon profiles, make tone and color adjustments in Nikon Scan, and create output files that are 8 bits per channel with either Adobe RGB or sRGB as the working color space. Each file is opened in Photoshop, assigned the appropriate standard working color space, and saved as described in the next section. The default Nikon scanner profile produced better results in my case than a custom scanner profile (made with Monaco EZcolor and a target from Wolf Faust). The tone and color adjustments with Nikon Scan are done with 16 bits per channel and usually produce results that require very little or no additional adjustments later. As usual, an image that is particularly problematic can be saved as 16 bits per channel for later processing with Photoshop. Nikon Scan embeds the profile for the working color space in the output file when color management is turned on. However, the embedded profiles are called “Nikon Adobe RGB 4.0.0.3000” and “Nikon sRGB 4.0.0.3001” rather than Adobe RGB and sRG. Some users and image-processing software may not recognize these as standard color spaces. The situation is further confused by the fact that Nikon Scan sets the EXIF color space field to sRGB even when the working color space is Adobe RGB. As discussed in Appendix A, correct EXIF color space information is valuable for archival images that may be used for many purposes over many decades. The best practice is to embed a standard color space profile and set the correct EXIF value for color space. If an image file from Nikon Scan is opened in Photoshop CS or Photoshop Elements, assigned the appropriate standard working color space, and saved with either the usual Save or Save As command, the output file will have the correct embedded profile and correct EXIF color space value. Nikon Scan can be operated from within Adobe Photoshop with the output image appearing directly in Photoshop, but the color management options must be handled carefully. When Nikon Scan is used this way the color management settings in Nikon Scan for monitor profile and working color space should be set to match the settings in Photoshop. The image is assigned the working color space that is the default in Photoshop even if that is not the output color space used in Nikon Scan. The working color space in Photoshop is not converted and can have the usual problems from improperly handled color space. Nikon, Inc., no date. Nikon Scan 4 Reference Manual. Accessed September 3, 2007 from http://www.nikonusa.com/pdf/NS4_man.pdf. Wagner, Patrick, no date. “Questions about Nikon Film Scanners.” Accessed January 17, 2011 from the ScanDig website at http://www.filmscanner.info/en/FragenNikonScanner.html.